On behalf of the College of Liberal Arts and Sciences (CLAS), we welcome you to the web page of the Office of Research and Creative Activities (ORCA) at the University of Colorado Denver. From projects that enhance the effective teaching of Science and Math at the K-12 levels, study and protect Colorado and global ecosystems, identify and treat disease, advance the humanities and arts, to those that identify causes of ethnic and gender health disparities, and create the technological innovations that will advance business and industry, researchers at the University of Colorado Denver are at the forefront of discovery in the 21st Century. Our faculty researchers also demonstrate their commitment to UCD’s primary mission of education by involving both undergraduate and graduate students in their research projects, thus giving them opportunities for learning and training through hands-on discovery. The College has experienced a banner year in new external research, creative and training awards. 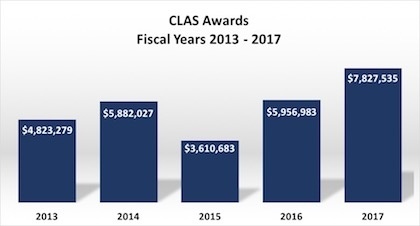 Over the past five fiscal years, awards to CLAS faculty researchers has averaged 6 million dollars. As shown in the figure CLAS researchers were awarded over $7.8 million this past year. We received awards from NIH and NSF, the Boettcher Foundation, the National Writing Project, and the National Park Service among many other national agencies, private foundations and local partners. The object of this web site is two-fold: for researchers, this site is intended to help you navigate through the grants and contracts process simply and intuitively by using a “life cycle” approach – from the birth of an idea, routing and grant submission/resubmission, award management, and ultimately, to award closeout; for visitors including prospective students, please have a look at our faculty projects section to learn more about the discovery, educational opportunities, business and technology linkages, and community service that is being facilitated through our faculty’s research endeavors. Whether you are a current or prospective faculty member or student, we hope you will join us in our mission as the premier urban Research Institution in Denver to advance our state, nation and world through research, innovation, and creative activities. The ORCA team: Laura Argys, Associate Dean for Research and Creative Activities, Carol Achziger, our Grants Development Coordinator, and Elizabeth Nylander our Grant and Contract Post Award Administrator are available to assist you in any way you may need. Please don’t hesitate to contact us. The College of Liberal Arts and Sciences has competitive funding for students who have been accepted to present their research at a conference. Current Undergraduate and Graduate students who are presenting a paper or poster may apply for financial assistance with the travel expenses. The CLAS Office of Research and Creative Activities phone numbers have changed! Please see below for an updated list of our phone numbers.